The separation solution of product and drive areas of or angle grinders and mixer grinders ensures hygienic and reliable production. 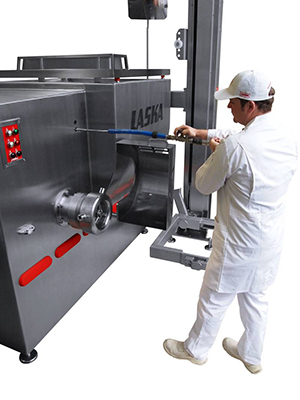 Our elaborate sealing solutions for LASKA industrial mincers and mixer-mincers of the series WW, WWB, and WMW have proven their worth in daily use. 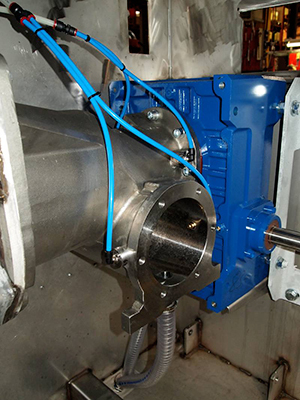 They offer an effective and simple solution to ensure a reliable separation between the product area designed in stainless steel and the related drive unit. 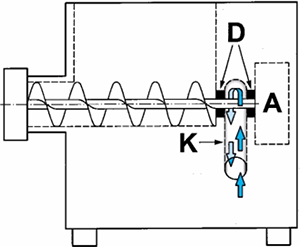 The middle figure shows the design as double-sealed chamber between the two zones, which can be easily cleaned in the course of the daily cleaning routine. Of course, all adjacent components are made of non-corrosive materials withstanding the usually tough cleaning sequences. The double sealing reliably prevents both the penetration of lubricant into the product and that of product residues into the drive elements. For the user, cleaning is very easy. The cleaning lance is introduced via two specifically designed openings in the machine frame (see upper picture). 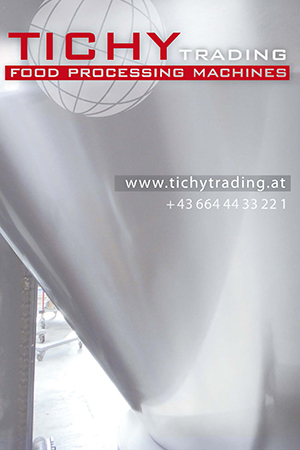 Due to this solution you can be sure to produce safe and hygienically perfect products on a permanent basis.